I bought my first laptop with everything I had saved from working two jobs the summer before I left for college. And with a few upgrades every now and again, she’s still kicking after about seven years. Now though, every whizzing noise the hard drive makes is starting to sound more and more like a death rattle. Apparently, I’m not alone -- according to Intel, there’s around 600 million PCs being used that are at least four years old, and ready to be upgraded. 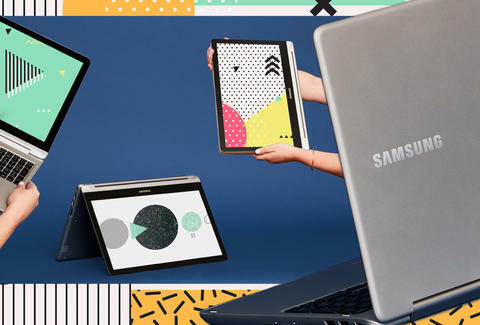 I’ve always been a bit dubious of the effectiveness of convertible laptops, and when I first saw this one, which comes in at 15in and weighs about 5lbs, I thought there was no way it would be useful as a tablet. But, for scrolling the internet on the couch, rotating the laptop into the tablet position actually makes a lot of sense. 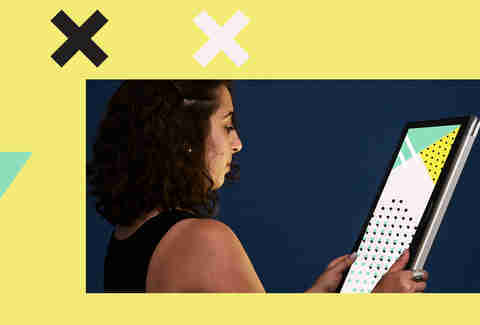 The larger screen makes it more comfortable to read an article, watch a video, or shop online because you’re not trying to prop up the screen three inches from your face -- oh, and you also don’t have a giant keyboard jabbing you in the pelvis while you veg out. Trying to stream a movie on an older laptop is downright torturous. Strategic positioning is required to avoid actually burning yourself by the heat your computer generates. On top of that, you’re waiting 10 minutes for a video to play, only to have Piper’s face become a scramble of pixels during key Orange Is the New Black scenes. All of that was gone with the Notebook 7 spin. Propped up in tent or stand mode, the computer’s underbelly is exposed so it can properly cool, and then it’s tricked out with a 1080p display and video high dynamic range mode, which makes colors and details really pop. Here’s how booting up my current computer works: I open it up, press the “on” button, then go feed the cat, make a sandwich, and come back just in time for my laptop to be able to handle me typing in the passcode. And while that’s a great example of my multi-tasking abilities, it’s not exactly user-friendly. When I first booted up the Notebook 7 spin, the text cursor immediately started happily blinking. A bit incredulous, I typed in the passcode, and was launched directly to the desktop. The whole process took about six seconds, thanks to the 128 GB solid state drive. While that solid state drive is an upgrade option, the standard models won't be left in the dust for long. They both come with an SSD slot, making it easier for people to make the upgrade later. If your laptop is older, you’re probably used to constantly being tethered to a wall charger in fear of a power outage, like some high-tech umbilical cord. But having to always be near an outlet makes the whole point of having a laptop moot. Might as well be sitting at your desk with your big-arse desktop. The Notebook 7 spin gets a charge that lasts about two hours after only 20 minutes in the socket. A full charge takes about 90 minutes on the 15 inch, and will last you several hours if you’re doing average stuff, like browsing the internet. (The 13-inch model takes 100 minutes to get a full charge.) If you’re playing video games or streaming super high definition video the battery may not last as long, but give it a break, it’s working hard to show you exactly how human these actors are, down to the last pore and concealed pimple. It hurts to say it, but I may have to consider retiring my laptop to that big recycling center in the sky (or, somewhere near Newark). Forcing her to stream Friends re-runs until her last, leg-scalding breath just seems cruel, especially when there are more shiny options out there. Sorry old friend, we had a nice run.